Finally! 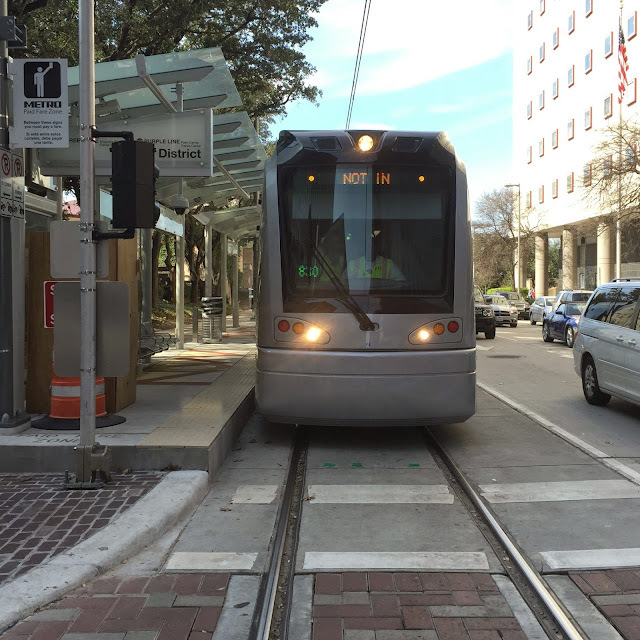 Houston's Purple (Southeast) and Green (East End) light rail lines open this weekend, Saturday May 23rd, after a series of delays pushed back its 2014 opening date. Dug Begley, transportation writer for the Houston Chronicle gives readers a history of the delays and what lies ahead for the route. Riders don't have to wait until the formal opening of the rail lines either. The public will be able to ride when service begins on the lines at 5 AM. BTW, on Saturday public can start riding Green and Purple Line trains when service starts before 5 am, not just after ribbon cutting in PM. I don't know if Ne-Yo and Frankie J have some sort of public transit agenda, but METRO has secured the artists for Railfest 2015 to be held at BBVA Compass Stadium on Saturday afternoon. The artists are a reflection of the communities that will now be served by rail, Houston's Third Ward, a heavily African American population, and the city's East End, a heavily Latino population. Maybe Ne-Yo is planning to drop a transit-themed remake of his latest (and rather explicitly-themed) song, "She Knows". Instead of gushing about a pole dancer, perhaps he will sing about the sleek design, curves and quiet operation of METRO's new CAF-USA rail cars as they ride up and down the rail. One can hope, but it's not likely. And, maybe Frankie J has moved on since his 2005 "Obsesion". Maybe he has become so obsessed with public transit, wants us all to know it, and will encourage Houston to trade in their commute to take the rail or bus. Again, not likely, but this should be a fun event. Doors for the event open at 4:30 PM, with entertainment beginning at 5:30 PM. The event is free, but does require a voucher, which can be downloaded here. More Railfest information can be found on METRO's website. Finally, as the construction of the Purple and Green rail lines has progressed, I have taken pictures of the progress, specifically at METRO's Theater District Station. This is the western-most station on the Purple and Green lines, directly in front of Downtown Houston's Bob Casey Federal Courthouse, and adjacent to Tranquillity Park. I began taking regular pictures in June of last year. Construction had already begun, but it gives a bit of view as to how the construction progressed. I had the chance to ride the Green Line last Friday thanks to Central Houston. Riders will enjoy an expanded transportation footprint to reach new parts of our city. Unfortunately, there are not a great deal of destinations along the line at this point, especially for anyone seeking a quick lunch-time getaway from Downtown Houston. We should see that change as time progresses. METRO CEO Tom Lambert gave details regarding the line's operation, and hinted at continued advances in technology that will make transit in Houston easier and more appealing, including real-time text updates for bus routes, as well as electronic ticketing. Be on the lookout as METRO pursues electronic ticketing in the coming months. Over the next few years, analysts expect healthy growth in the construction industry with more available construction jobs and more construction projects to pursue. In certain industrial applications, there is a need for embedding the air cooled chillers. Such floors also make the space available for installing them. Preparation of initial plan layout after making proper analysis of the location and other resources. The data should be presented in the common way the bookkeeping is kept, although accounts may regard a particular construction project. If you are thinking to install pit and pipe in your home and garden, and also looking for a good pit and pipe installation company, then you can book us for best and safely installment. Appreciable. Similarly after a year in 2016, the first phase of Bangalore METRO started its services, and still other phases of METRO requires some time to complete its construction. The concept of Purple and Green lines in Bangalore serves the best possible way due its tremendous traffic. Such types of Innovating Infrastructure works are always admirable.